Tami is the Chief Mom behind VarageSale. 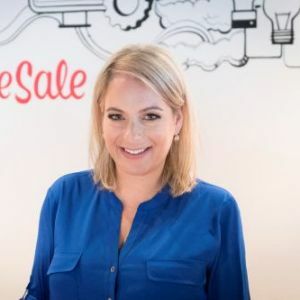 While on extended maternity leave in 2011, she came up with the idea for a safer and better buy and sell app that would stretch family budgets and connect local communities. With the help of her programmer husband and Co-Founder, the VarageSale platform was born just months after the birth of her son in May of 2012 and recently acquired in November, 2017. VarageSale was venture backed by US investors, Sequoia Capital, Lightspeed Ventures and Floodgate, as well as Canadian investors, Real Ventures,Version One Ventures and iNovia. As Co-Founder and Chief Customer Officer of the award-winning startup, Tami spent her time helping new communities launch, leading her ever-growing team and coming up with new product ideas to improve user experience. Today, aside from being a stay at home mom, Tami contributes her time as a mentor for Techstars, Toronto’s first Canadian accelerator program. She also takes on a role in the “Founder City” project: A peer community of 500+ founders and teams, trained to support each other, solve problems, and attract talent. Previous to this, Tami spent 10 years teaching, molding and motivating the future stars of the world. Tami grew up in Montreal and graduated from McGill University with a Bachelor of Education. She currently resides in Toronto, Ontario.